Heat oven to 350°F. Spray cookie sheet and 12x12-inch sheet of foil with cooking spray. In food processor, place cereal and sugar; process with on-and-off motions until fine crumbs form. Add water and melted butter; process until thoroughly mixed. Spread cereal mixture evenly in center of cookie sheet. Use foil, sprayed side down, to press cereal mixture slightly; roll with rolling pin into 12x8-inch rectangle, about 1/8 inch thick. With sharp knife, score mixture into 1-inch squares. Bake 12 to 15 minutes or until squares are golden brown. Cool completely, about 10 minutes. Meanwhile, in small bowl, place whipped topping; fold in lime juice until blended. Break cereal mixture apart at scored lines. Reserve 4 cereal squares; crumble remaining squares into small pieces. 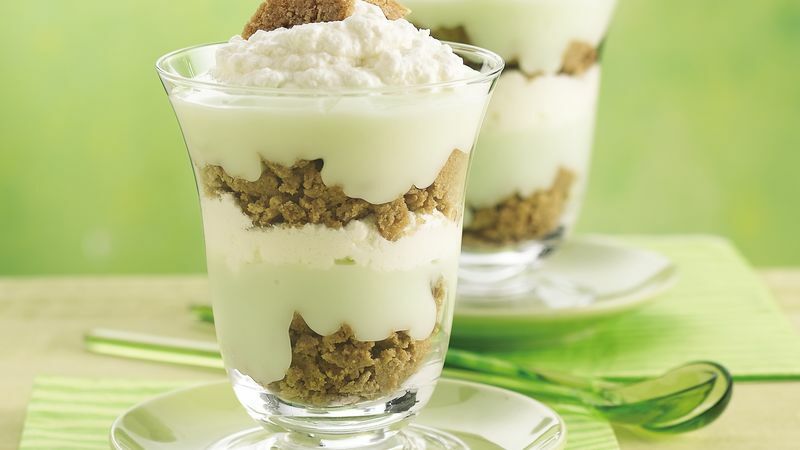 In each dessert bowl or 12-oz parfait glass, layer 1/4 cup crumbled cereal squares, half container of yogurt and scant 1/4 cup whipped topping mixture. Repeat layers. Top each parfait with 2 reserved cereal squares.